Question: If you could change one thing about yourself, what would it be? I am Asian. To be specific, I am half Filipino and half Indian. And I was born in Hong Kong. I talk about where I come from a lot because I’m proudly Asian. Just Asian. That’s how I identify. But there was a time, I wasn’t proudly just Asian. There was a time, that if you asked me what’s one thing I could change about myself, it would be that I would want to be less Asian. There was a time I wished I were half-American and that’s what I would tell people. Really. I was about 13 years old when it started. I would either deny my Indian side or Filipino side and say my other half was American. No one ever questioned it because my accent was not distinctly Asian. I was particularly ashamed of my Filipino side because of where they stood in the social hierarchy in Hong Kong. Growing up, most Filipinos in Hong Kong worked as domestic helpers. Because of that they sat at the bottom of the social hierarchy. I didn’t want that to happen to me, so I shed as much of my Filipino identity as I could. Before I go on, I want to just acknowledge the sacrifices that Filipino domestic helpers make when they leave their families in the Philippines to look after another family in Hong Kong, for very little pay and often in substandard living conditions. What they do for their families, in unfair circumstances, takes strength and they should be admired for that. Anyway, I shed my Filipino identity and I adopted a more western identity. I tried to be like the other kids at my international school. I listened to their music, dressed like them, ate their food, watched their movies, all because I thought if I could be more like them who represented the dominant culture (the American and British expats), then I would be placed higher on the social hierarchy. Even my family reinforced this. My mother warned me against tanning for too long in the sun – not because I might get sunburnt, but because I might look too dark. My Aunt, would buy me bleaching soap from the Philippines to “brighten” my skin. It seemed normal and I honestly never questioned it. There are skin whitening products sold all over Asia, to this day. But that wasn’t the most harmful part. The most harmful and shameful part is that I started seeing myself as better than my Filipino counterparts because of my ability to assimilate to the dominant culture and this is really hard for me to admit. I wish I could tell you that changed as I grew older but it didn’t. After going to college in Australia, I moved back to Hong Kong for a couple of years and in the beginning I had a hard time looking for work. After lots of interviews that went nowhere, I eventually found work through a friend and got a job as a Teacher’s Assistant at an international school. After a few months, another friend with a tutoring business offered me a job as a tutor making really good money on the side. I remember that first session when I arrived at the home of the family whose son I was about to tutor. The first session went really well, until when I was about to leave, the mother started grilling me with questions asking where I was from, where I studied and what my qualifications were. This questioning after each session persisted for three weeks. This mother questioned me asking: how long did you study in Australia for, where do you teach now, how many students are there, where did you teach before. She didn’t stop, she even rang the school I worked at to verify my employment. Finally, one week, she straight up asked me: why I didn’t look Indian and I said I was half Filipino (up to this point I had kept that to myself). Then she asked how I could afford to go to Australia, why my English was so good, what job my father had. But instead of challenging her I decided, mostly because of the money, that I needed to press on until the sessions were up and just prove how awesome a tutor I was. And I did. I pressed on. Every session answering her questions. Until it came to our last session. I honestly didn’t think she was going to renew for another set of sessions. I was so sure she would ask for a Native English speaking tutor. But she instead asked if I would consider continuing to tutor her son and she would pay me cash upfront instead of going through the agency. I felt pretty chuffed that she had finally seen that I was just as capable and qualified a tutor as a Native Speaker from America or England but then she only offered me half my pay and that’s when I realized, even if I did do as good a job as a Native Speaker – I wasn’t worth the same pay. Simply because of my race, she quantified my worth as less than. This experience, added to the internalized racism that was festering inside me. The self hate, the disgust and the disrespect I had for my Filipino heritage and how I projected this on to fellow Filipinos were all a result of my desire to align more with those I viewed were powerful. I understood that, if only I could just behave the way they did, and not act too Filipino, and assimilate to the dominant group, then I could be accepted by them, seen to be as powerful as them. Anything short of that was substandard, less than, and would put me lower on the social hierarchy. That’s where the Canaanite woman stood in the social hierarchy in this setting, over 2000 years ago. The Canaanites were especially disliked by the Ancient Jews because they are historical enemies. The Canaanites are a racial group that descended from Noah’s grandson, Canaan. Their animosity for one another grew from fighting over the land of Canaan, the land the God promised to Abraham’s descendants. The Canaanite were also idol worshipers and so they were seen as unclean and immoral. In contrast, the Ancient Jews viewed themselves as the chosen people. They considered themselves Children of God and everyone else were “others”. They dictated the standard of how one must live through their own religious practices and anything that fell short of that was considered substandard - less than - other. The passage we read earlier is from the gospel of Matthew which is most likely written by Matthew, one of Jesus’ disciples, a fellow Jew. This account is written specifically for a Jewish audience. We read that Jesus has left a predominantly Jewish region to one inhabited by mostly non-Jews, ie. Gentiles. And that is where he encounters the Canaanite woman. The disciples don’t see it as out of the ordinary when Jesus ignores her at first, because Jews and Gentiles don’t fraternize, and so they urge him to send her away, he responds by saying: he’s only come for the Jewish people. Then when this woman BEGS for his help in healing her daughter, Jesus responds by saying he wasn’t going to take from God’s children by giving to a dog. Wait, wait, wait… back up…Jesus indirectly (but pretty directly) called this woman a dog?! And as if that wasn’t shocking enough, the woman challenges Jesus, a man, a rabbi, someone who is socially superior. Instead of walking away, she challenges him saying that even dogs eat the crumbs that fall from their master’s table. She says, that even she, a Gentile, someone as lowly and unclean as a dog, is worthy of his blessing. That it isn’t just limited to the children of God. Then, after this tense and awkward exchange, Jesus praises this woman’s faith, heals her daughter and sends her on her way. Before I dive into this passage, let’s quickly put this exchange into context. Let’s see where Matthew places this story and why he has focused on specific details. This story also appears in the gospel of Mark but is retold slightly differently with different events occurring before and after and I think the reason behind the sequence of events for Matthew is because his audience were fellow Jews AND because of bread. Yes, bread. And that’s where we are going to start. Jesus shows his indiscriminate heart towards to people of Israel and towards Gentiles through BREAD. Only a chapter before this encounter, Jesus was on the north end of the sea of Galilee, a largely Jewish area, and Matthew writes about the miracle of Jesus feeding the five thousand with only five loads of bread and two fish. You remember that? He feeds about five thousand people and collects 12 baskets of leftovers. But what’s the difference between the two references to bread in these stories? It is the contrast of bread in abundance in the story of feeding the five thousand vs a scarcity of bread in the form of crumbs in Jesus’ conversation with the Canaanite woman. Bread is: what is shared to socially bond with one another. Jesus breaks bread with his disciples during the last supper to signify a bond between them. So we can assume from this too that bread is shared with those you respect and have concern for. In sharing bread with the five thousand, Jesus and his disciples bond with them and in the act of sharing bread communally, they form respect and extend care for one another. Bread is also symbolic of God’s provision. We see in this story of feeding the five thousand that God blesses the people of Israel by multiplying God’s provision. And so what’s the opposite of that, when there is famine, when bread is withheld? It was thought that famine, lack of provision, bread withheld and the scarcity of bread was a mark of God’s judgement for their wrong doing. Hold that thought. They both acted in faith. One in stepping out into the water, the other, in refusing to take no for an answer. One believing and having faith, the other doubted, but Jesus helped them both. Then we read about a conversation Jesus has with the Pharisees and his disciples where he compares ritual cleanliness with moral cleanliness. Matthew was being very strategic when he placed this conversation Jesus with the Pharisees, calling out their hypocrisy in believing these rituals are what keeps people clean. Otherwise, without these practices, people are defiled, immoral and unclean. These people are the Gentiles, and includes the people of Canaan. And right after this conversation, is when we meet the Canaanite woman, in a region of predominantly Gentile people – the people viewed as unclean by the standards set by the oral traditions of the Pharisees. It is no coincidence that we see these stories all occur one after another. The blessing and feeding of the five thousand in the north of the sea of Galilee, where bread and God’s blessings are seen as abundant. Then to contrast to that, Matthew makes it clear to the reader: Look at this: we are so willing to share our bread with multitudes if they are fellow Jews. But with a Gentile, we won’t even share a crumb. With a Gentile, we deem them unclean and unworthy of our bread supply (symbolic of God’s provision and blessings). We cut them off. And remember what withholding bread symbolized? THE MARK OF GOD’S JUDGMENT. Basically, the writer Matthew, wants to make it explicit to the reader that the attitude of the Jews towards the Gentiles is that the Gentiles are only worthy of God’s judgment and wrath because they do not measure up to the standards that have been passed down in the oral tradition. Here’s the kicker: Even the Canaanite woman has come to believe that she too is unworthy, unclean, inferior, as lowly as a dog, but still wishes to partake in just a crumbs worth of the blessings being offered by the Son of God. So, Jesus shows us with the parallel cry of Peter and this woman, that he doesn’t discriminate between their races. And then he furthers his point with bread. Because guess what he does next, after this exchange? He performs a parallel miracle and he feeds four thousand, the exact same way he fed five thousand in the north end of the Sea of Galilee. This time he feeds the four thousand, in a predominantly Gentile region. He feeds predominantly Gentile people – showing the disciples that his blessings are not limited to just the children of God – Jesus’ blessings extend to the Gentile people. He does not discriminate between their races. We see bread again in abundance. That bread is in abundance for the Jews. That bread is in abundance for the Gentiles too. That their blessings are not to be reduced to bread crumbs fallen from the table for dogs (even if that’s all they may perceive they deserve), but their blessing is the same as the Jews. The Gentiles may not meet the standards of cleanliness set out by the tradition of the elders, set out by a culture that marginalizes them and sees them as less than. But Matthew shows the readers that JESUS, does not place those measures on them. Jesus does not discriminate, Jesus blesses this woman, and blessed four thousand more following her and encourages the disciples, and thus the readers, to do the same. So obviously, this is a story where we can see that, through the actions of Jesus, God’s love transcends racial lines. And here’s how my life resonates with this story. 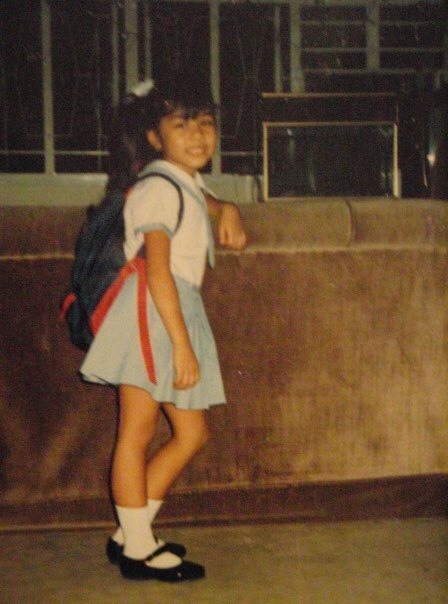 As a Filipina woman growing up in Hong Kong, I understood that I was sub-standard. I accepted this worldview of Filipinos and adopted that identity just like this woman understood herself to be as lowly as a dog. I viewed my fellow Filipinos the same way. I understood we were less than. That who we were and our work was not worth as much. I was frustrated with how Filipinos were viewed and how they were treated but I feared that I would be seen as the same but instead of fighting for their equal treatment, I thought the answer was to distance myself and deny that part of my identity so I could measure more closer to the dominant standards. The standard set by the West. I didn’t recognize the unfair treatment of Filipinos in Hong Kong growing up. I measured them up against the standard that I was taught and when they didn’t measure up, I attributed it to them not trying hard enough. I didn’t recognize the everyday hurdles they faced, I didn’t bother finding out their stories. Then, six years ago, I moved to the US where Filipinos don’t have this stigma and I bought into another worldview….and that was of the “model minority” who were measured up against the White American standard. It made so much sense to me because of all the other skewed ideologies I had bought into in my upbringing. Makes sense right? That’s how I was brought up: I understood that if you want to be successful, you simply have to work hard. And that if you were struggling, its because you weren’t putting in the hard work. I bought into and participated in a lie about Asians being the model minority because they more closely met the standards set by the west. And in Hong Kong, I participated in and bought into a lie that said that Filipinos were than, and were placed at the bottom because they were so far off from the acceptable standard – once again, a standard set by the west. And I wish, I wish, I wish, it didn’t take me over 30 years of my life to realize that I was worthy. Because like the Canaanite woman, up until a few years ago, I thought my worth was the size of a morsel or bread crumb unless I could measure up to a standard set by the West. And like the Pharisees, I placed these expectations on fellow Filipinos and other minorities too, believing we were only worthy if we met the standards set by the west. That we needed to meet their standard of beauty, wealth, intelligence and way of life. But now, today, as every day I become more and more woke – I want to act like Jesus in this story and hope to be part of changing the way Filipinos and the greater Asian population are seen. Like Jesus, I hope to see people beyond their labels and consider their story, their experiences and their history. Like Jesus, I hope to call people to come and break bread together, to bond and find respect for one another, tearing down racial barriers, tearing down stereotypes and tearing down the expectations unfairly set by the dominant culture. “model minority” reinforce pre-existing stereotypes, it also undermines the experiences of marginalized Asian Americans; these misplaced generalizations render their experiences trivial at best and invisible at worst. The stereotype perpetuates conflict between communities of color, prohibiting solidarity and promoting racial hierarchies. In order to move forward, we need to partner together in refusing to participate in and perpetuating the myth of the model minority. I think this is something we can all do, whether we identify as Asian American, or just moved here from another country, or identify as White American, Latino American, or African American or any combination of these labels. -go and read about where the myth of the model minority came from and why it hurts Asian Americans and other minority groups in the United States. Talk about it in your small groups. Talk about whether or not you have formed stereotypes because of the myth of the model minority. -go bond, share bread, and be in relationship with Asian Americans and get to know them as human beings, as individuals first and foremost. Don’t make your conversation or relationship with them about a fascination with their otherness. See them as people first, because it is from there that you can dispel the stereotypes about Asian Americans. -quit expecting minorities to measure up to an unfair standard. That’s something we can ALL do. Because it places unnecessary pressure on all minorities, don’t do that. Don’t perpetuate something that shames others if they miss the mark. Instead, go and find beauty, strength and value in what they bring to the table. Promote and empower minority voices and products. Read books, listen to songs, watch movies, buy products from minorities. Like Jesus, we need to recognize when our worldview has influenced how we label and see others and act against it by working towards making things right, calling out systems that are unfair and recognize that worthiness and value is not determined by one set standard. I also want to say this to my fellow Asians in the room or listening online who may have been hurt by the “model minority” label, either because they were pressured by it or fell short of it. I hope you know that you are enough. These standards are man made and made to drive a wedge between us and other minorities. I acknowledge my own participation in perpetuating this myth and ask your forgiveness. I ask your forgiveness when I saw myself better than you because of my ability to assimilate to the dominant cultre. I ask your forgiveness for labeling you and not considering your history and your experience. I promise to move forward by celebrating and recognizing the uniqueness of our cultural identity and encourage others to do the same.